Work is one of the most dominant and unavoidable realities of life. Though experiences of work vary tremendously, many Christians share a common struggle of having to live in seemingly bifurcated spheres of work and faith. Beginning with the conviction that Christian faith permeates all aspects of life, Joshua Sweeden explores Christian understandings of ""good work"" in relationship to ethics, community practice, and ecclesial witness. In The Church and Work, Sweeden provides a substantial contribution to the theological conversation about work by proposing an ecclesiological grounding for good work. He argues that many of the prominent theological proposals for good work are too abstract from context and demonstrates how the church can be understood as generative for both the theology and practice of good work. This needed ecclesiological development takes seriously the role of context in the ongoing discernment of good work and specifically explores how ecclesial life and practice shape and inform good work. Christian understandings of good work are inconceivable without the church. Accordingly, the church is not simply the recipient and a dispenser of a theology of work, but the locus of its development. ""This richly theological book makes explicit the resources of Christian theology for the world of work and for the support of laypeople in day-to-day lives. Too few books tackle this important subject. The Church and Work creatively engages the existing literature and offers important new insights into how ecclesial life and practice can shape and inform good work."" --Esther D. Reed, University of Exeter ""This volume stands to makes a significant contribution to Christian theologies of work, particularly through its attention to ecclesiology and the particularities of context. This book also shows the continued importance of ecclesiology to practical theology and highlights the category of practice as worthy of attention in studies of the church."" --Claire Wolfteich, Boston University School of Theology ""The Church and Work is a deeply theological and very timely reminder that neither work nor the worship of the church stands still. Thinking about work always is, or rather should be, to re-examine in great concreteness who and how we worship."" --Brian Brock, University of Aberdeen ""Rather than abandoning work to the marketplace, Sweeden offers a theologically sound, congregationally sensitive treatment of work central to the Christian life. 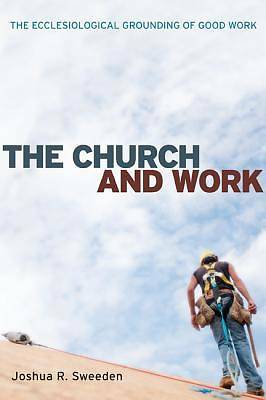 While providing a sound introduction to classic and contemporary definitions of work, Sweeden's unique contribution rests with his articulating work as a form of ecclesial practice, a compelling view that makes the book a necessary read."" --Dean G. Blevins, Nazarene Theological Seminary Joshua Sweeden is Assistant Professor of Theology/Richard B. Parker co-chair in Wesleyan Theology at George Fox Evangelical Seminary.